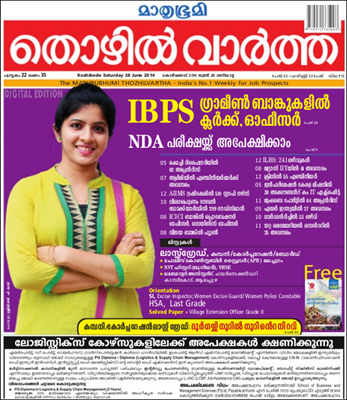 Mathrubumi Thozhilvartha, one of the leading employment weekly in Kerala has published the 28th June 2014 issue. As like its previous issues, prime importance is given to the Kerala PSC notifications and solved paper. The major highlight of the current issue will be latest PSC notifications. The rank list of Last Grade, Company/Corporation/Board has also been published. Special orientation is given on the upcoming exams like Sub Inspector of Police, Excise Inspector and Women Excise Guard/Women Police Constable. Through the exam point of view HAS and Last Grade are given consideration. The solved paper of the recent held Village Extension Officer Grade II is also given. While going through the pages, IBPS 2015 notification for vacancies in Gramin Bank (Officer, Clerk), NDA Admission 2014, Appendices in Cochin Refineries(62), Trademan in Naval Dock Vishakapattanam (299), Staff nurses in AIMMS Rishikesh(510), Probationary officer in ICICI bank, Engineers in Army, Peon in Vijay Bank and 241 vacancies in ILBS are also mentioned. Added to it, 39 Accountant vacancies in Information Kerala Mission, 64 appendices in Mumbai port, 27 opening in Air India and 25 rising vacancies with Tata Memorial Centre are also mentioned in the current issue. PSC last grade ranklist and solved paper of Village Extension Officer (VEO). Short list of Police Constable Driver (Malappuram), NVT History Junior, Rank list of Laboratory Assistant in Higher Secondary Kasargod and Alappuzha have also found place in this issue. As the first phase of Last Grade Servant exam begins in September 2014, we can expect more intense coaching in the coming issues of 'Thozhilvartha'. Solved question papers and coaching for K-TET, LP/UP, HSA can be expected in the next issues. Job seekers in Kerala can best use 'Thozhilvartha' to check for rising opportunities and also could apply for their preferred posts. 'With a circulation of more than 1 lakh, 'Thozhilveedhi' has truly channelized as a medium for training many youngsters to live their dreams. As an effective platform for job vacancies and career training, this employment newspaper has motivated million to thrive. Catering the need of the employment seekers, 'Thozhilvartha' is the perfect choice for young graduates and other experienced persons. So can anyone miss the current issue of this ostentatious employment newspaper? Grab 28th June 2014 issue of 'Thozhilveedhi' from your nearest book vendor and prove to be the real winner.